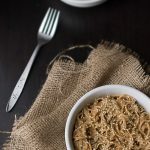 These vegan cold sesame soba noodles are a fast and healthy meal! I’m kind of a nostalgia junkie. I love visiting sites such as this one and enjoying small trips down memory lane. I get this strange feeling in my chest when I see something I’d completely forgotten about. It’s hard to describe the feeling… a jolt? A rush of joy mixed with a touch of longing and a dash of sadness? I always find forgotten memories slightly sad. What else am I forgetting? Regardless, I love the feeling. A single image can bring back so many associated memories. A glimpse of an old toy will take me back to the room where I played with it. 30 years may have passed since I’ve tasted a particular candy but I remember exactly how it tasted the moment I see it. It’s amazing how our minds work, isn’t it? I don’t live terribly far from my first childhood home. My parents still reside in the house where I lived from age 9 until college so I visit it regularly. But that first house… I want to peek inside so badly and see how it looks 25 years later. Sometimes when I’m in the neighborhood I’ll drive past it. There’s a tot lot right behind the house. I haven’t been there in years but there have been days when I’ve sat on the swings at the tot lot, marveling at the short distance between the playground and my old backyard. It’s a small hill, but when I was little it was like running the length of a football field. At the end of the football field was a massive weeping willow tree that I used to hide under. The tree is still there. How small would that house look now if I walked through the halls, the kitchen, the bedrooms? I’m fascinated by the distorted perspective of my memories. I’ve only seen those walls through the eyes of a 9 year old. I know it would look tiny now but in my mind the inside of the house is so big. If I were to visit now the green shag carpet from my bedroom would probably be long gone as well as the yellow and white tiles from my playroom. I would love to see it but I don’t see how that’s possible. I would never knock on the front door. Do I write a letter? It seems like something so simple yet so unattainable. I’m not sure there’s any way to request entering a stranger’s home without sounding creepy. I guess I’ll just have to settle for distorted memories and an occasional visit to the tot lot on top of the not-so-big hill. Prepare soba noodles according to instructions. Drain, reserving about 3 tablespoons of the pasta water. Rinse with cold water and set aside. 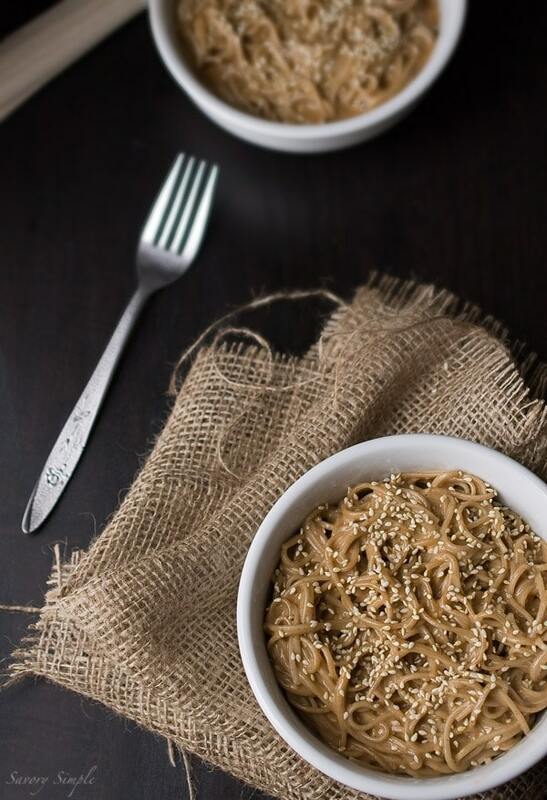 In a small bowl whisk together peanut butter, toasted sesame oil, soy sauce, chili oil, light agave, 1 tablespoon sesame seeds and pasta water. Toss the soba noodles and sauce together. Garnish with remaining sesame seeds before serving. I am very nostalgic too. It can make me very upset easily, as I miss the past and dread what the future holds all at once. What’s funny is that there are only a handful of things from the past I would want back but sometimes I’d be willing to take all the bad too just to have those few good things again. Sometimes I think the distorted memories are better, or at least more fun. My brother lives in my childhood home and it kind of messes with your memories, you know? Because I am so familiar with it now. This sounds insanely delicious and comforting! Oh, I am familiar with that happy yet sad nostalgic feeling *sigh*. Anyway :) Love this dish, looks absolutely delicious. One of the things that make us remember of our old house is the good food that we miss eating so much. The taste is somehow unforgettable especially if prepared by familiar hands. There is nothing better than eating at home with loved ones. I lived in so many places growing up, all in the same town. Recently I’ve been having dreams where I wander the houses. It’s neat. These noodles look sooo good! Ok, so I had to google “tot lot” to figure out where that term came from (I could assume what it was but never heard that name), and an Urban Dictionary definition said that if someone uses this term they live in, or are from MD ;). P.S. 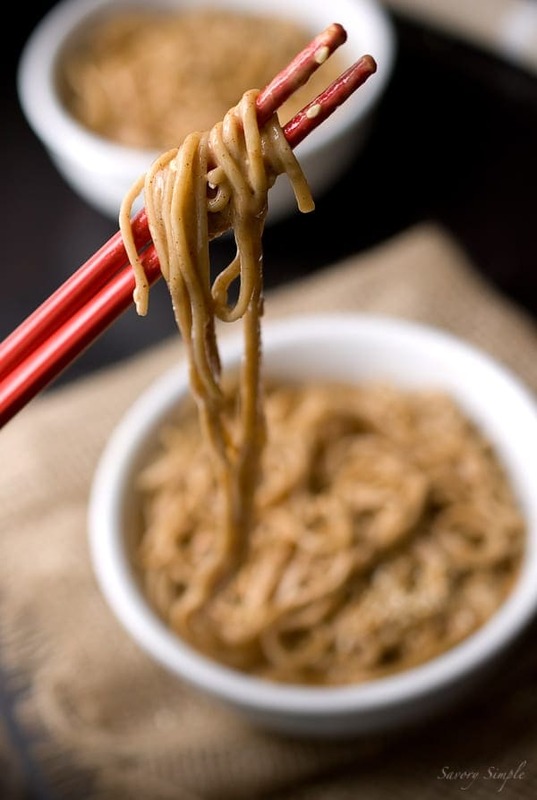 Those noodles look delicious and I am definitely making them tomorrow!